Sunday I took another visit to Greenwood Cemetery, an African-American cemetery here in Nashville. 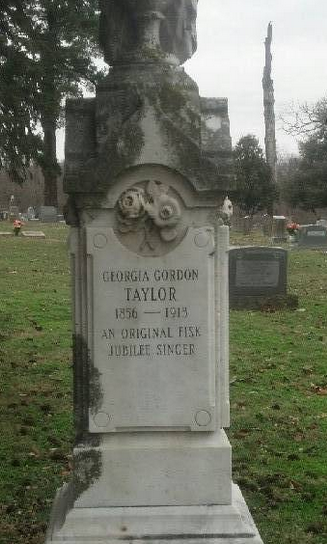 While photographing tombstones, I saw the one for Georgia Gordon Taylor. Georgia was one of the original Fisk Jubilee singers, and wife to Rev. Preston Taylor, the founder of Greenwood Cemetery. She and Preston married on May 7, 1890. Georgia passed away almost 100 years ago on June 7, 1913. I also looked up her obituary – this is what appeared in the June 13, 1913 issue of the Nashville Globe. On Saturday morning the death angel came into the city of Nashville and removed from her midst one of her most highly respected women, Mrs. Georgia Minor Gordon Taylor. She had suffered for several months, and the end was not a surprise to those who had some knowledge of the condition, and in fact she realized several months ago that it was only a question of time with her. It was only five hours between the time that Mr. William Brewster was found dead when Mrs. Taylor breathed her last. 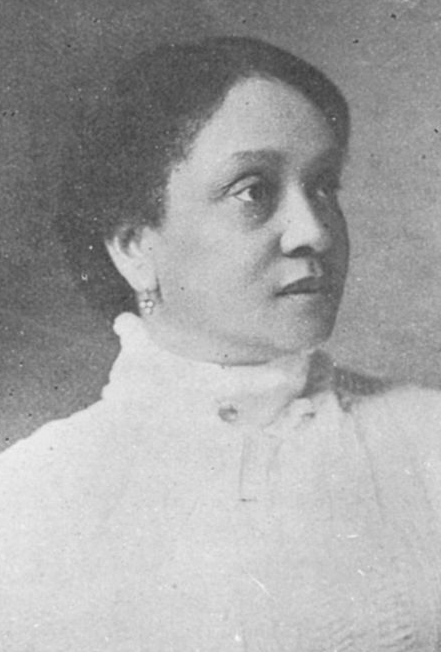 Mrs. Taylor was one of the best known characters in this city, and she enjoyed both a national and international reputation as a Jubilee Singer. The following obituary for Charles C. Poindexter appeared in the June 6, 1913 issue of the Nashville Globe newspaper. Charles C. Poindexter, who was Professor of the Agriculture Department and Biology at Fisk University, died at Hubbard Hospital shortly after 12 o’clock Tuesday morning. He was operated on by Drs. Stewart and Welker Saturday and made good progress until an unfavorable change came Sunday afternoon, resulting in complications and ending in his death. Prof. Poindexter was born in West Virginia March 10, 1880; he was a graduate from the Ohio State University in 1903 and did post graduate work for two years at Cornell University. Upon completion of his work at Cornell, he became director of Agriculture work for both St. Paul School at Lawrenceburg, Virginia and St. Augustine School at Raleigh, North Carolina under the Episcopal Church. From there he was called to Fisk University four years ago was assistant professor of Agriculture and Biology. In recognition of his efficiency and character, two years ago he was elevated to full professorship. During his residence at Cornell he married Miss Florence Mercedes of Ithica, New York, March 31, 1905. A son was born to them in the summer of 1909. These two with three sisters and a brother survive him. The funeral was held Thursday morning at 9 O’clock in Fisk Memorial Chapel, and the remains were interred at the Greenwood Cemetery. The following young men of Fisk student body acted as pallbearers: Messrs. Nelson Glover, Raymond Powell, Charles Lewis, Overton Carter, Atwood Wilson and Henry Ferguson. Towards the beginning of the month I helped the Society of American Archivists locate a photograph of Dwight Hillis Wilson Sr. (1909-1962). 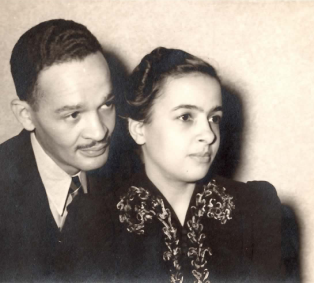 Mr. Wilson was an established archivist with the Allied Forces Records Administration in Washington, DC. Born in Raleigh, NC on October 18, 1909 & educated at Shaw University & Howard College, Mr. Wilson was the first archivist of Fisk University. The Society of American Archivists is celebrating their 75th year this year; as part of the festivities, they are creating a series of trading cards of notable members. Mr. Wilson is among them, however, they did not have a picture – nor did Fisk. I was intrigued by their call for help and within half an hour of searching, had a phone number for Mr. Wilson’s son, Dwight Wilson Jr. The next day, I made contact with him and he graciously sent the SAA the following two pictures of his father. Dwight Wilson Sr. with son Dwight Jr. Thank you Mr. Wilson for sharing these pictures of your family. born at Nashville, TeDD., Nov.
MOORE, George Washington, clergyman; born at Nashville, Tenn., Nov. 9, 1864: son of William Moore and Elizabeth Corry, slaves, who were legally married after slavery was abolished: A.B., Fisk Univ., 1881, A.M., 1884: B.D., Oberlin Theological Seminary, 0., 1883: (D.D., Howard Univ.,1908); married Ella Sheppard, of Nashville, Dec. 20, 1882; she was of the original Jubilee Singers; 2 children: George S. (M.D. ), Clinton Fisk R. Began to exhort in little mission connected with first echool he attended: preached in Howard Chapel, Nashville, 1876: ordained Congregational ministry, 1877: while in Oberlin Seminary past’lred 1st Congregational Church, Sullivan, O. ; in charge 3 churches under Ohio Home Missionary Society, summer, 1882: pastor Lincoln Memorial Church, Washington, D. C., 1883-92: professor of biblical history and literature, Howard Univ., 1887-92; delegate to World’s Sunday School Convention, 1889, and delivered address in City Temple, London, Eng. ; began as field missionary with American Missionary Assn, New York, 1892, later appointed supt. in charge southern church work with headquarters at Nashville. Trustee Tillotson College. Fisk Univ. Republican. Address: 926 17th Ave. N., Nashville, Tenn.
clan: born at NashvUle, Tenn., Sept.
MOORE, George Sheppard, physician: born at Nashville, Tenn., Sept. 27, 1883: son of Rev. George W. and Ella (Sheppard) Moore: A.B., Fisk Univ., Nashville, Tenn., 1906: M.D., Northwestern Univ. Medical College, Chicago, Ill., 1910: interne Freedmen’s Hospital, Washington, D. C., 1910-11: married Julia Alberta Merrill, of Nashville, Oct. 13, 1906: 3 children: George C., Sarah E., Julia A. Practiced In Nashville since June 1, 1911: professor of mental and nervous diseases Meharry Medical College (Walded Univ.). Republican. Congregationalist. Member Tenn. Colored Medical Assn., Rock City Medical Assn., Knights of Pythias. Home: 1034 17th Ave. N. Office: 424 Cedar St., Nashville, Tenn.
Raleigh, N.C., March 30 — The Fisk University Jubilee Singers, who appeared here Monday, were a treat. Nearly 500 whites attended. Mr. Hayes of the Fisk Jubilee Singers preached at the First Baptist Church Sunday. Sheryl Cashin, a law professor at Georgetown University and author of the book, The Agitator’s Daughter, was recently in Nashville to discuss her book. A descendant of Herschel Cashin, Sheryl’s extended family tree includes some people mentioned here on this blog. Several of her family members (including both of her parents) were Fiskites her aunt Minnie V. Cashin married the nephew of James Carroll Napier. Despite the fact that I work at Vanderbilt, I was not able to attend the lecture, but a video is now available online. Check it out! As the closing days of the Meharry Medical College draw nigh, and as the senior class begin to make preparations to bid adieu to old friends and familiar scenes, one begins to look around to see the personalities of the class. Many familiar faces are seen therein. Some of the young men have spent seven and eight years attending school in Nashville, but as a rule they come from distant cities. It is often the case that the home boys go elsewhere to finish because of the old maxim, “A Prophet is not without honor save in his own country.” This however, has not been the case with Richard Cheatham Hunter, the eldest son of Mr. and Mrs. James L. Hunter of 1309 Hynes street, who finishes with the class of 1907, Meharry. Young Mr. Hunter has spent all of his life in this city, having been born corner Fifth avenue and Broadway just twenty-five years ago. He finished his grammar school education in the city schools of Nashville, then entered Fisk and finished the college department with the class of 1903. While looking around to see what profession he would like to take, he was absent from Nashville only about two years, then returned and decided to take a medical course. He entered Meharry and from the beginning has shown remarkable ability as a pupil. He has studied hard in order to get all there was to be had out of his studies. He has been recently offered a position as one of the interns at the Freedman’s Hospital, Washington, D.C. and will probably leave this week to accept. This will give him a wonderful opporutnity to further fit himself for the profession. But, in accepting the intern, he must reject the recent honor thrust upon him by the class in making him their salutatorian. But in the face of the advantages to be derived from the stay in the hospital at Washington, and because he must go at once, if he expects to accept the offer, the class decided that they could allow him to go with their best wishes. Hence they unanimously agreed. Just who will be elected to succeed Mr. Hunter as the salutatorian has not been learned. All of Nashville will no doubt feel proud to send forth into the medical profession such a promising young man, who was so singularly honored by such a large class. He stands well not only in his class and at school, but with the people of the city, many of whom have known him since boyhood. Just where he will locate after leaving the Freedman Hospital is not known. One of the beautiful characteristics of his career has been that he has been one of the few self-supporting young men, notwithstanding his long college career at the two schools, he has managed to make his own way. His future will be watched with the deepest interest by his friends and acquaintances at home. See Richard in the 1912 Fisk Catalogue. By 1912, he was living in Chicago, Illinois. See Richard in the 1912 Meharry Catalogue (go to page 43 of 80). Here, he is listed as being in Edwington, Alberta, Canada.